Problems of testing, measurement and verification of the wide range of product attributes in technical use has become for all serious producers an every day necessity. Especially in the last years it is possible to see rapidly increasing interest in the executing of noise tests. 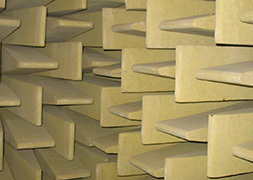 Company TALPA-RPF started with the construction of anechoic or semi-anechoic chambers in 1994, when the first job was done for the company PETROF (the producer of the pianos). The construction of the acoustic lab (the anechoic or semi-anechoic chamber) presents the acoustic modification of the suitable room with the necessary volume. The acoustic modification is realized by the assembling of the walls, floor and roof of the room with special cones from non-reflective material.